7 Chakra Products used to balance our physical and energy body and their corresponding chakras. These products are well designed keeping into mind the metaphysical aspect of the human body. The energy centers which controls different organs in our body are also known as chakras. The 7 chakra crystals and their products are designed to balance, harmonize and normalize the energy body and their energy centers/chakras respectively. Our body has 7 major chakra centers where vital energy flows and intersects. These real gemstone pendants help to center, clear, balance and vitalize for our optimal well-being. The 7 chakra stones pendant helps in the stimulation of centric powers of the human body. 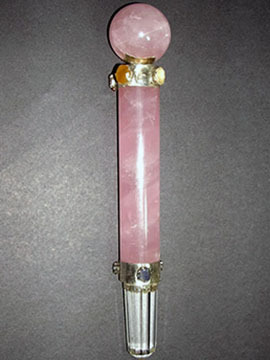 We use different gemstones to manufacture chakra pendants. Each stone represents one of the seven chakras. At Prana crystals, we have a variety of stones which includes Amethyst, Iolite, Moon, Peridot, Citrine, Carnelian, Red Garnet and many more. These semi-precious stone stimulate chakras to transmit and receive physical, emotional, and spiritual energy. These stones also help release negative energy and channelize them effectively. 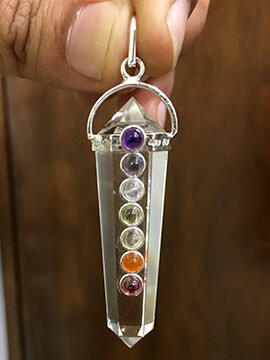 7 Chakra pendants with real gemstones embedded in it, corresponds the Chakras in the human body. For wholesale and bulk 7 chakra product inquiries do contact us. Are your Chakras or the Energy centers of your body properly balanced and working? One can properly balance the chakras by wearing & chakra pendants or any 7 chakra product as recommended by the crystal healer.